We're very fond of the distinguished malts from Säntis hailing from Appenzell in eastern Switzerland. Brewed at Locher Brewery since 1886, from high-protein brewers malts, the wash is distilled through a sophisticated Arnold-Holstein still, creating an extremely pure, single-malt spirit. In this way Säntis brews a similar wash to those of our local Tasmanian distilleries, imprinting a highly singular aesthetic through their precise distilling technique. Then the magic of the ageing happens, and these elegant malts truly begin to take shape. The Säntis malts are aged predominantly in old beer casks, which may be anywhere between 60 to 130 years old. These barrels were used until the 1970s to transport beer to regional inns from the Locher Brewery in Appenzell. These anciet casks were sealed using a pitch or plant-resin, to prevent the beer from tastng of wood, and from carbon dioxide from escaping. In essence, sealing the casks helped ensure that both the beer and the casks remained young and fresh. Over decades of use, the pitch sometimes became cracked, allowing the beer to soak into the barrels, at times up to a depth of one centimetre. These century-old aromas and beer extracts are utilised to impart flavours in the same way that other whisky producers utilise old sherry, port or bourbon casks. In the mid 1990s Karl Locher was faced with a problem. The brewery had a stockpile the aforementioned ancient oak casks, and they weren't getting any younger. Karl Locher had an idea. He asked himself whether it would be possible to utilise the old beer casks in some way; to capture the matured aromas and flavours that had been preserved in his ancestors' beer casks. Due to the trials of WWII, the law in Switzerland prohibited the distillation of barley, one of the cournty's most staple food sources. 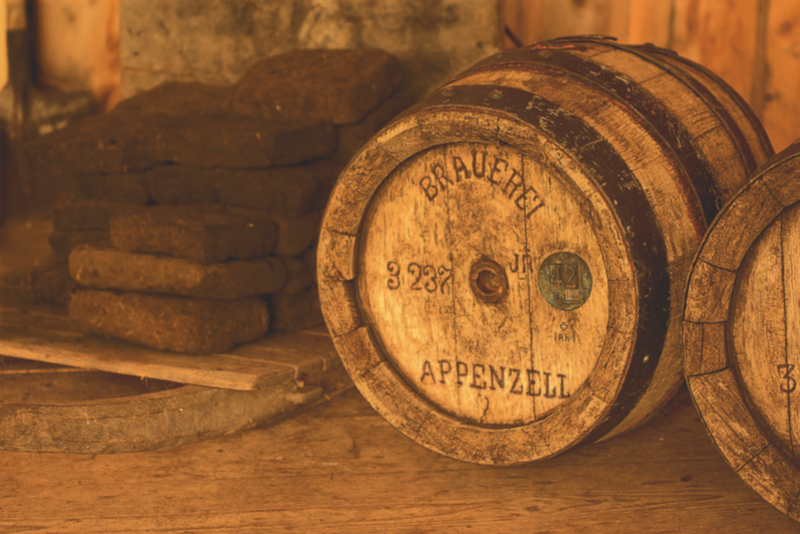 In 1999, this law was removed, and Karl Locher's parth was clear, he could now turn his beloved brewery into a distillery, his cellars into ageing warehouses, his ancestors' brews into malt whisky. Named after the tallest alpine peak that dominates the skyline of Appenzell, Säntis Single Malt Alpine Whisky was born. Säntis is now producing multiple award-winning whiskies that are completely unique in the world.